One summer while out fishing, my older brother caught a snapping turtle. He brought it home and put it in a styrofoam cooler with a brick on the lid. All of our friends came around and we dared them to feed it a minnow. I was too scared to do it myself but would always watch when someone else would do it. They would hold the tiny fish pointed at the turtle’s face. It would slowly open it’s mouth and slowly extend it’s neck and then crunch down on the fish cutting it in half. The trick was to keep your hand steady and not flinch when it happened. When it started getting dark out we brought it back down to the river and let it go. At least the turtle got some free food out of the deal. o_0, i just hope he can unhook the parachute in time. Pertinent questions: How long does your line have to be when sky fishing? How fast do you have to reel in your line to keep it from going slack? Is sky fishing better over salt water or fresh water? Heh, gives new meaning to “flying fish”. Since when has a fatal-looking experience stopped good ol’ Biff? I think this is the first real action shot for Biff. It looks great! 1) Today Biff tries sky fishing, messes it up. 2) Yesterday he tried bungee jumping, messed it up. 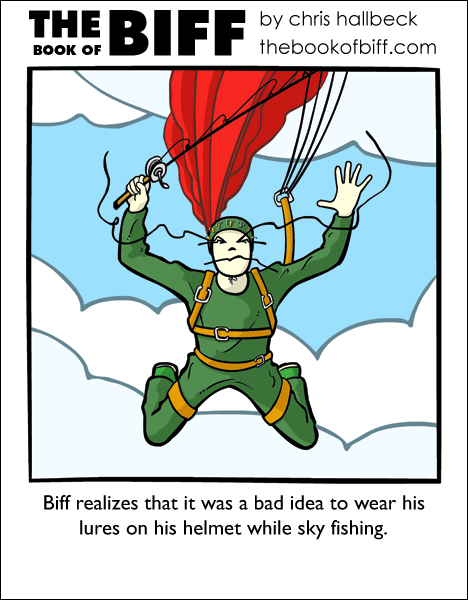 Maybe Biff isn’t the best person to do extreme sports. Also, if he doesn’t put them on his helmet, where are they supposed to go? Does this mean he “caught” his parachute? Hm, so I guess Biff was trying to cach the very tricky Gullfish. Too bad he forgot that Gullfish (much like their land counterparts, the gremlins) like to mess up parachutes, and found an easy way with Biff’s lures. Bah, he’ll be fine! It’s not like he packed an anvil in his pack. I’ve caught myself looking in a mirror. Man, that makes me want to go skyfishing again. Been at least a year since I went last. Really, you don’t get this one? 1) Biff went skyfishing. This isn’t a real sport. Not only are there not sky fish, but even if there were the way to fish the skies would be to use a net. 2) Think about skyfishing. Even if there were sky fish, the way you’d have to cast would be to bring your pole up into your parachute. This sport entirely guarantees participant death. 3) The thing that cought Biff up wasn’t the most obvious trap of the sport, but one of the minor details. This would be like Biff learning to not walk into a mine field because his shoes get dirty, having nothing at all to do with the mines themselves. I guess he got his jetpack to work properly and is now figuring out what to do on the way back down. haha, the skydiving and playing cards has been my all-time favorite. so this is great to see him in the air again, hahahahaha. *all time favorite Biff comic. i don’t think it would do too fine as a hobby of my own. I like NNFB, and have NO idea what you’re talking about. I really believe the ideal of Biff being immortal. I bet he’s the last man on earth because his godly powers got out of hand, and he just can’t remember it. In the explosion of his power, he became mute and made of tofu. Sky fishing for flying fish?